The Typo is dead, huzzah! BlackBerry has settled its lawsuit against the makers of the the terrible Ryan Seacrest-backed snap-on physical keyboard for iPhones. You might recall that Seacrest’s Typo made a big splash a few years ago when it was first released. 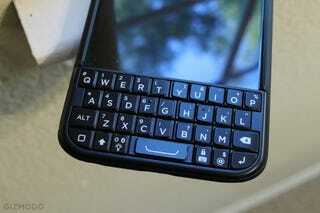 The design was an obvious homage to the old-school BlackBerry keyboard that many were addicted to. And as such, it was a blatant violation of BlackBerry patents—so the Canadian manufacturer sued Typo, LLC—which ended up being fined nearly $900,000 dollars when it violated an injunction against selling the keyboard. As we learned when we reviewed the Typo a while back, it’s total garbage. So good riddance. I didn’t think I would say this ever again, but thank you, BlackBerry! Hey Ryan Seacrest—you just got owned by the most pathetic company in technology. Quite an accomplishment.